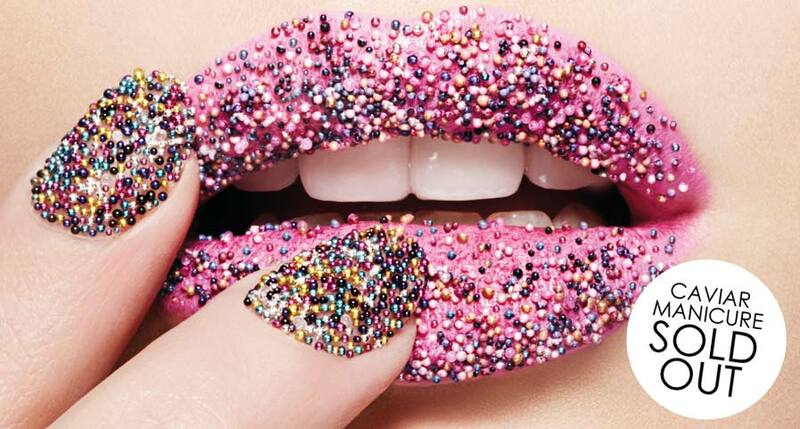 While searching for some inspiration for a nail design on fashion websites, I noted a particular theme this season. Color blocking seems like it will never go out of style, but this year, it looks like brights are the go-to colors. I observed color-blocking on the runway last year this time and while the colors were bold and eye-catching, they weren’t nearly this bright. Check out this lemon yellow Nanette Lepore dress. Now check out the model on her way off the runway in that bright coral dress with neon yellow accessories!!! LOVE! From what I’ve been able to pick up, when color-blocking this spring, the key is to keep things bold and graphic kind of like these Guiseppe Zanotti patent sandals from Net-a-Porter. 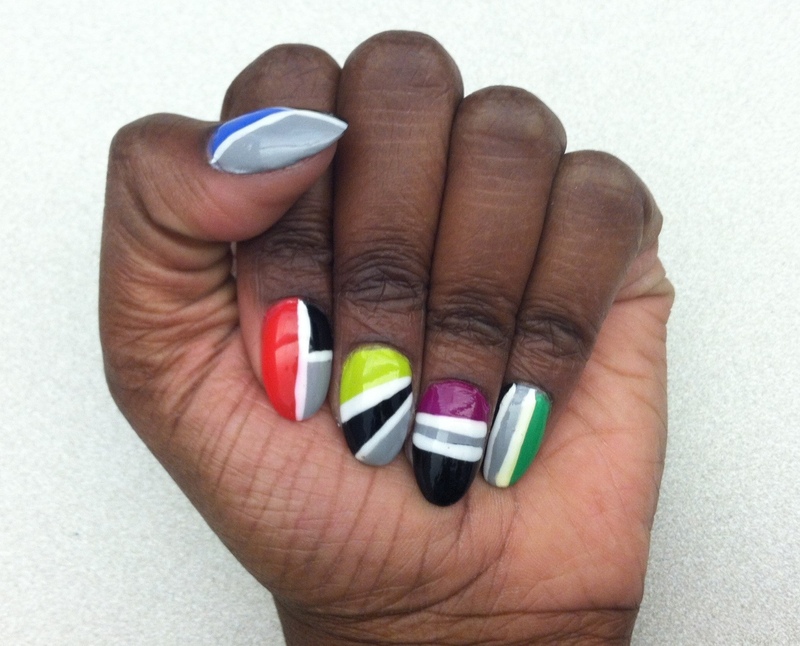 For this manicure, I used several colors: Sally Hansen Xtreme Wear Pacific Blue (blue), Orly Passion Fruit (pink), OPI Did It On ‘Em (yellow-green), Julep Helena (purple), Julep Leah (green), Orly Liquid Vinyl (black) and China Glaze Pelican Gray (gray). 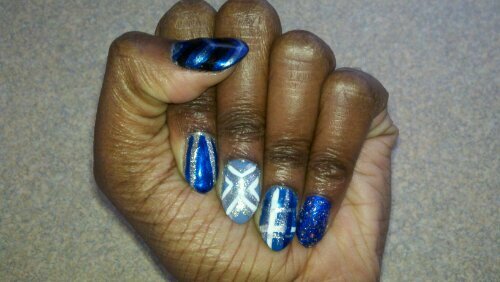 I also used a white Kiss Nail Art striper for the white lines. So yesterday or the day before, Necole Bitchie, a fashion/trend/gossip blogger asked her fans if the manicure below was ‘Bitchie or Not’. I’m guessing ‘Bitchie’ is good so I definitely vote Bitchie! 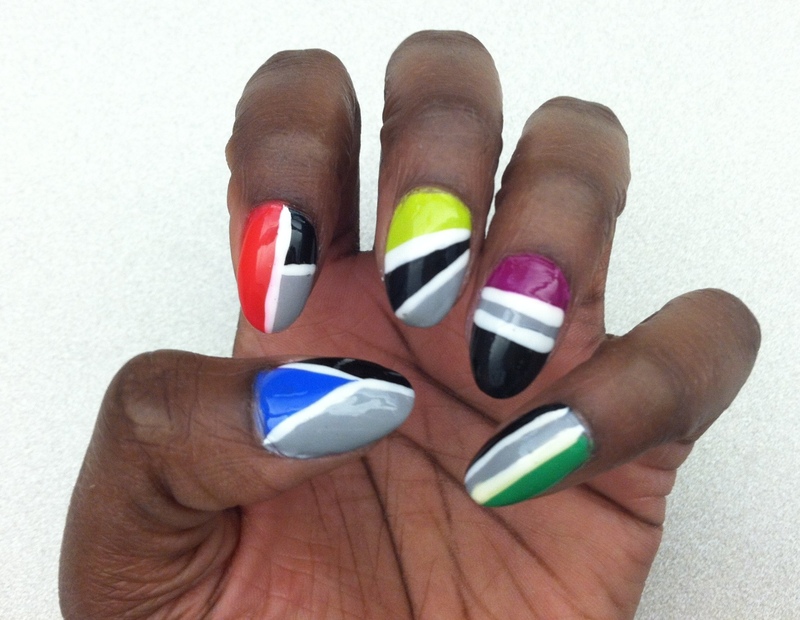 Pop art-inspired manicures aren’t particularly new but I decided to dip my toes in the stream of this trend for my first manicure of the new year. Hey hey, here are pics from my first “client”! 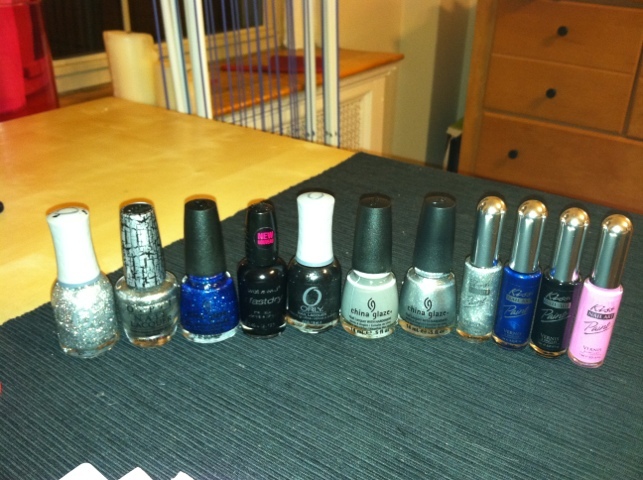 This nail fan offered a donation towards my nail polish obsession, *clears throat*, I mean hobby in exchange for two hands full of designs. Her only request: Use pink and purple. 10 little blank canvases, eh? The result is what you see above. I honestly didn’t keep track of what I used on which fingers…I just went with the flow. 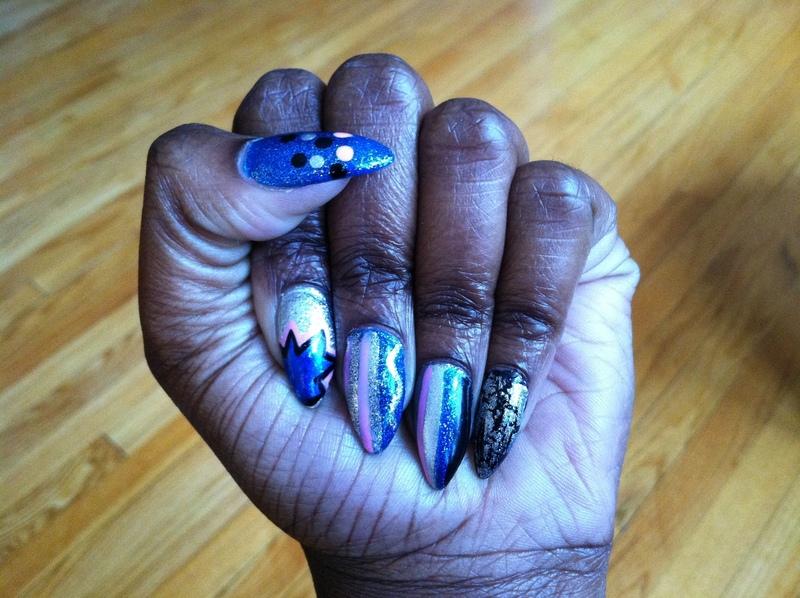 If you’ve been following my blog since the beginning (or have looked at my old posts), you may recognize the Purple Leopard print which was one of my first nail art designs posted on this site. Now usually after I’ve done a manicure on myself, I’m too creatively-spent to think about doing another manicure for at least another day. 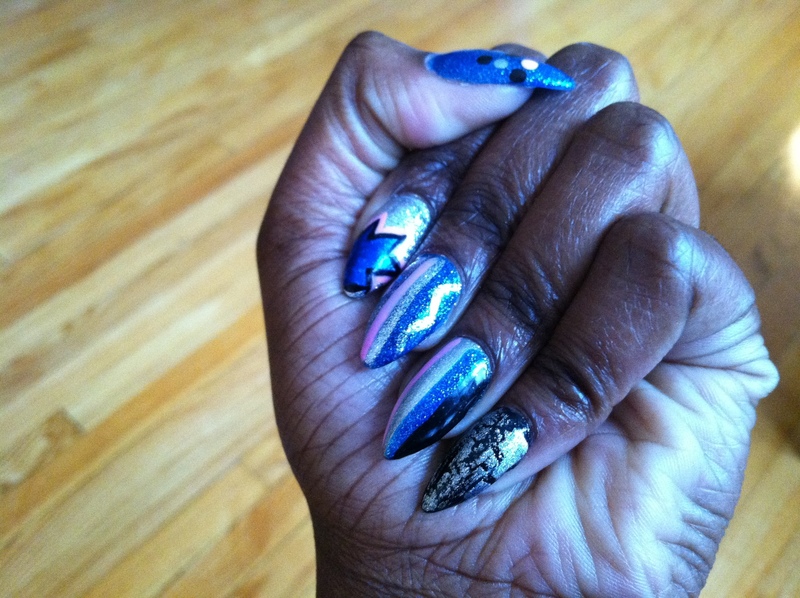 But a couple hours later, I was working on my own nails…another free-flowing creative manicure using all sorts of blues. I’m beginning to realize that, unless I’ve been inspired by something I see or I give myself time to let the creativity bug work through me, it’s hard for me to do a manicure…hence the reduced frequency of my posts. When I was actively searching for inspiration (or drawing from the long list of suggestions I’ve gotten), I’d do 2-3 manicures per week. Now I wait for something to strike me…or I’ll take advantage of a free block of time to relax, let go and create. 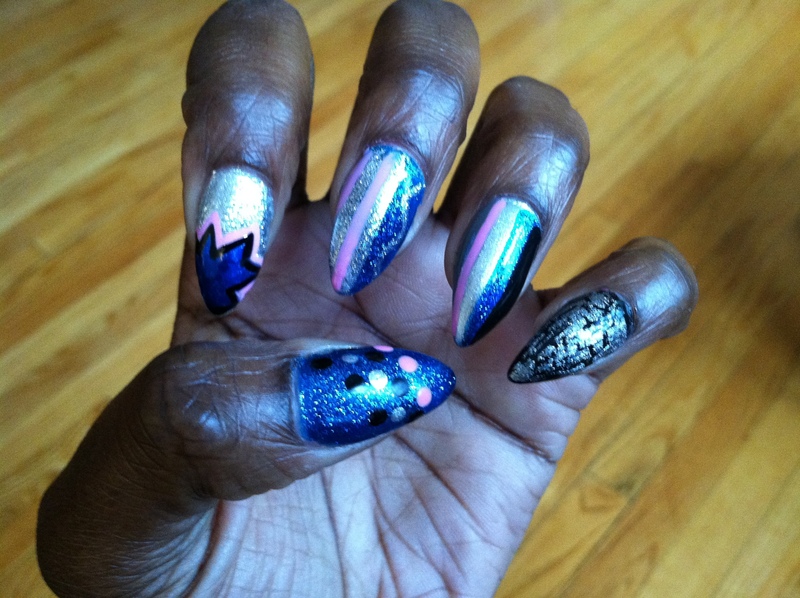 That translates to me doing my nails less frequently (once a week/maybe twice) but these creations seem better to me. In an effort to expand my horizons, this past weekend I checked out a documentary about Charles and Ray Eames. You may not know them by name (I didn’t before Friday) but chances are great that you know the art and design masterpieces they created together over several decades. Awesome individually as an architect (Charles) and a painter (Ray), they were best known for their collaborative efforts which led to these popular, innovative, relatively affordable chair designs. Their motto: The best for the most for the least. Here are a few examples…. Ok, whose grandparents had this chair/ottoman set? I’m pretty sure mine did. Here is more information about the history Eames house, also known as Case Study House #8. 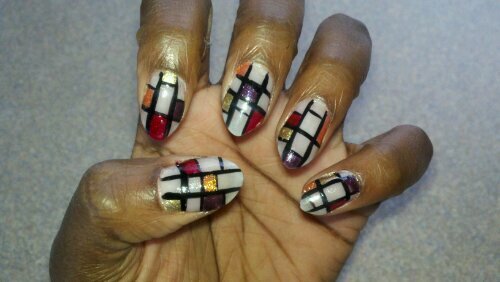 For this manicure, I used one coat of Essie Ballet Slippers, a very pale pink, to provide a neutral background for this take on a stained glass nail effect. 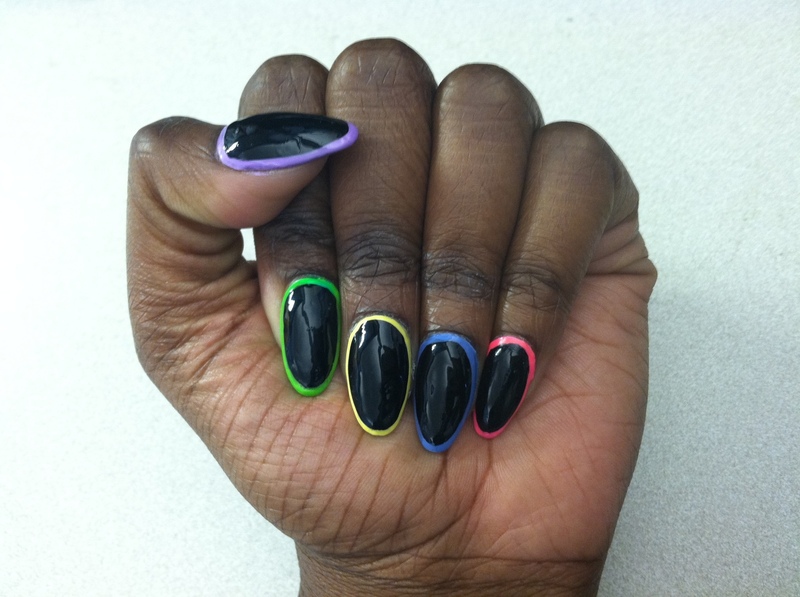 I used a black Kiss Nail Artist brush to paint the lines. Instead of the primary colors the Eames used, I chose some pretty fall colors for this manicure (Thanks Mom!). I, at random, filled in squares with China Glaze Ruby Pumps (microglitter red), Orly Fowl Play (deep purple with orange and red glitter), Wet n Wild Fast Dry 9.0.2.1.Orange (shimmery orange/gold), and Orly Luxe (metallic gold). The Eames were inspired by his work while designing their house and I was inspired by the Eames. 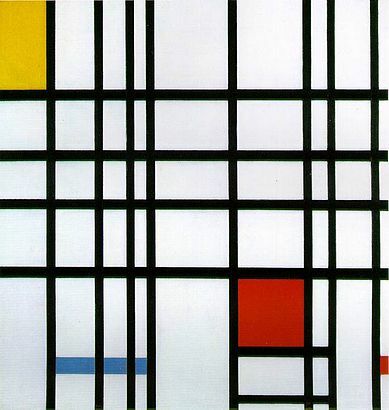 For more info about Mondrian, check out this Wikipedia entry. For that reason, I’ve changed the name of this post to give credit where credit is due. you bring joy in the morning. Ok folks, this post will be short and sweet. I love honeycrisp apples. I mean, I wrote poetry and dedicated nail art to them. They, in my humble opinion, are deserving. 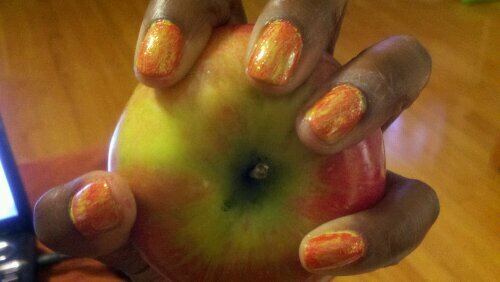 For this manicure I did 2 coats of China Glaze Electric Pineapple (a bright yellow green creme) and allowed that to dry. Then I did one coat of China Glaze Cherry Pie (a shimmery semi-sheer red) one nail at a time and gently scraped down each nail with a fanned paint brush to create that textured appearance. 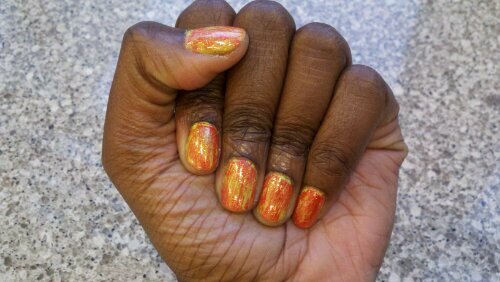 I followed up with a thin coat of Wet n Wild Fast Dry The Gold and The Beautiful (a brassy gold micro glitter) to top it off. Sadly it’s cloudy today so I couldn’t post a picture with direct natural sunlight but I will be updating this post with a picture of this manicure in direct sunlight ASAP. It’s so pretty! 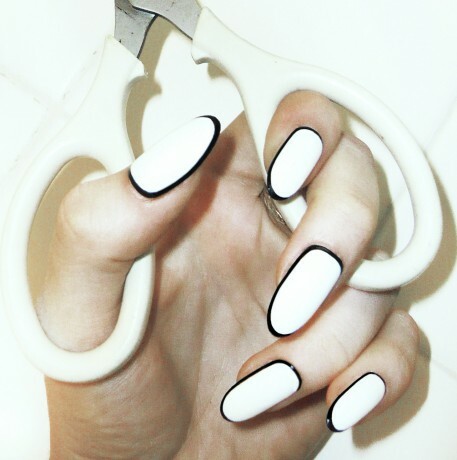 Lately I’ve been experiencing a writer’s block of sorts when it comes to new ideas for nail art. I’m only interested in doing original work and sometimes I just get…stuck. I have a long list of things I’d like to do but I’ve been struggling to come up with interesting, new, and different ways of painting each idea. I voiced this frustration on Twitter and I got 2 funny/great responses back. 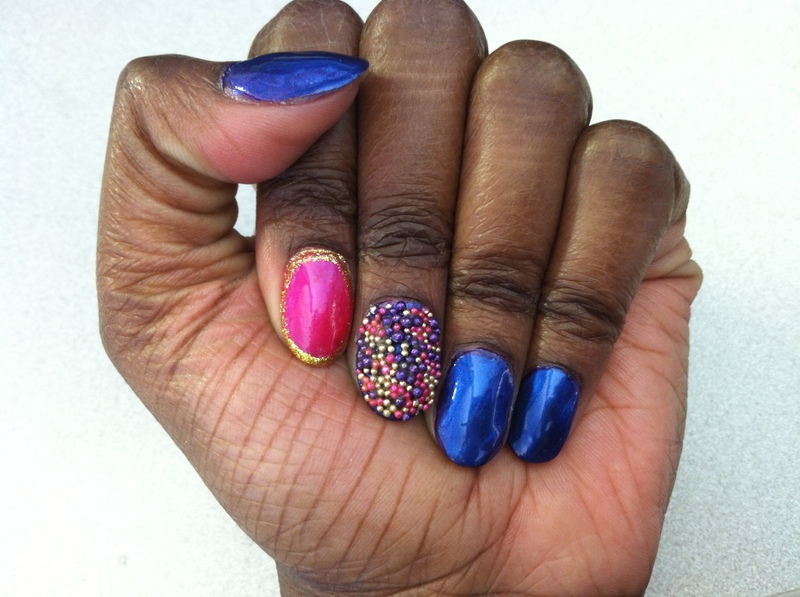 Response #1 “I’ve got an idea, Ice cream sandwich nail art! I’m hungry.” Response #2: “Neopolitan nails. 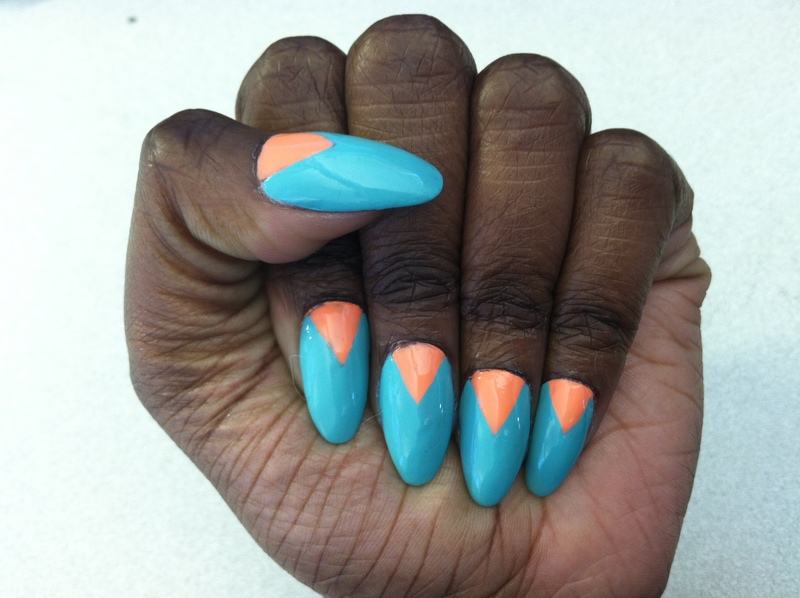 You could easily do an Ice Cream series.” Well well…how about Neopolitan Ice Cream Sandwich Nails? This is for you Carmelita and Kyra! For the “strawberry” and “vanilla” ice cream colors, I used China Glaze Go Go Pink and White Out, respectively. The “chocolate” ice cream and chocolate cake sandwich pieces (what are those called?!) colors were a bit more difficult. I have one chocolate brown nail polish color: China Glaze Goin’ My Way. I had to figure out a way to make it a little lighter for the chocolate ice cream and a little darker for the chocolate cake sandwich pieces. Through some experimentation of layering different colors underneath and on top, I ended up using a black layer (Wet n Wild Fast Dry Ebony Hates Chris) under Goin’ My Way for the chocolate cake sandwich pieces and a mocha layer (China Glaze Swing Baby) on top of Goin’ My Way for the chocolate ice cream. I love a good challenge! 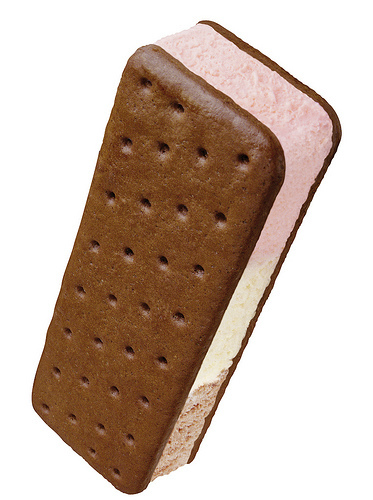 Thanks for the idea, ladies…now I want one of these ice cream sandwiches! This wasn’t my first foray into ice cream nails. 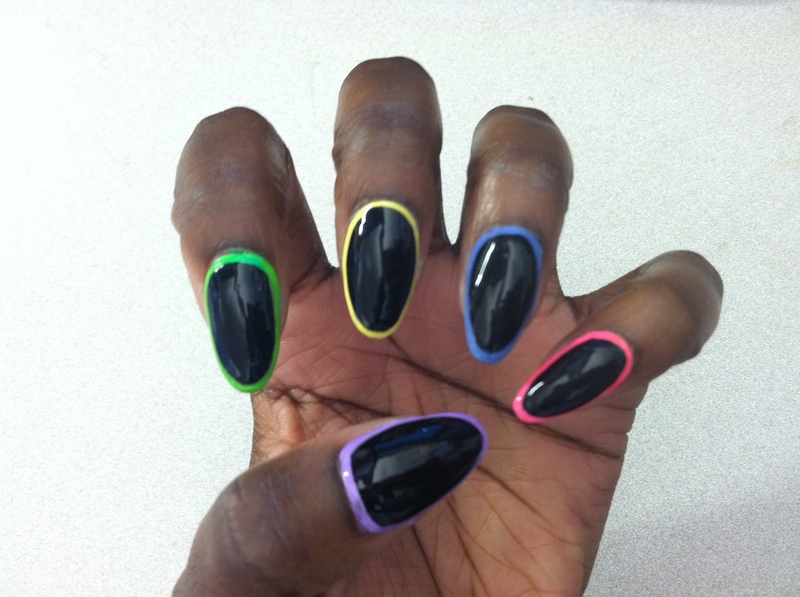 Check out my Superman Ice Cream nails post. This past Saturday, I was visiting all my favorite stores looking for nail polish deals and I happened upon this promotional package from China Glaze and Seche Vite at Sally Beauty for $8.99. Not only was it a great deal but I was in the market for more Seche Vite AND I loved the shade of the pink China Glaze polish, Go Go Pink. I even didn’t think twice about picking this up. To create the manicure in this post, I used Go Go Pink as the base color, then sponged on Orly Pixy Stix, a darker but more vivid pink, near the cuticle of my nail and Orly Dazzle, a silver chrome, near the tips of my nails in sort of a french manicure arch. I used Orly Etoile, a iridescent top coat that is a part of their French Manicure collection, on top for a sparkly effect that can really be seen in direct sunlight. The weird thing about Etoile is the majority of the bottles I found were transparent with a slight lavender tint except one which had a slight pink tint. 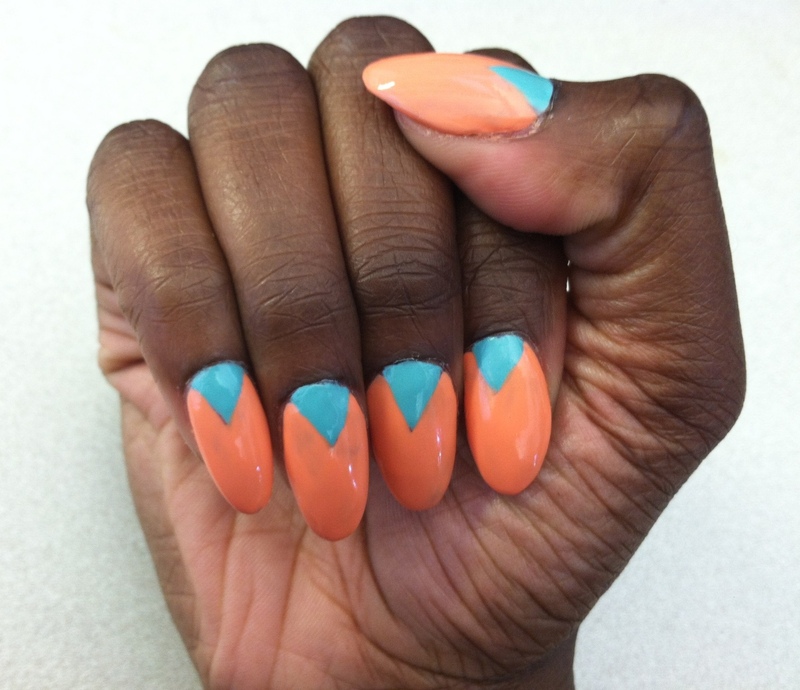 Yep, I bought both and used the pink tint version for this manicure…they were both so pretty! I also had a coupon so I didn’t feel too bad. I used Orly Pixy Stix to create the pink ribbon on my ring finger. Finally, I dedicate this post to the memory of my aunt who lost her battle to breast cancer in 2007 at the age of 49. I miss her.